“I want to move to Miami”. A sentence that is both daunting and exciting at the same time. Most people dream of moving to Miami for blue skies, sunshine, fun and most importantly, a change in their lives. Miami is a place people go to reinvent themselves, start over or escape a city where they are no longer happy. But where do you begin? For me, it was by following a guide on MiamiBeach411. Let me start off by saying this isn’t a story that explains how to get that elusive green card or work visa for Europeans. Born with dual citizenship, I am blessed to be able to enter America and never get stopped by immigration. Instead this is a story about the steps I took and what I actually did to successfully move here. When I first discovered MiamiBeach411, I was living in England, fed up with grey skies, long commutes and cold weather. I lived on Starbucks, the familiar white and green cup grasped in one hand with my blackberry a permanent fixture in the other. Not a very colorful existence, but that is city living for most people. I decided on a whim, it’s time to live out that unfulfilled dream and move to America. And coming from England, if I was going to make a life change, it had to include sunshine! My first thought was Hawaii but after reading stories about how to ship your belongings there, I decided on a city in a nearer time zone to London. These were the only two reasons I originally chose Miami… 5 hours behind London and the beach. As many others before and after me have discovered, when you google moving to Miami, an article written by Doug for this site comes up in the first search results: How I Moved to South Beach: Budget-Minded Tips from A New Resident. The opening paragraph “For those of you who want to follow your bliss without forfeiting your life savings, listen up! I’ve picked up a lot of useful knowledge in my escape to paradise, and I’m happy to pass it on! And here I am! I actually pulled it off! This was my strategy. Feel free to copy it or amend it as you see fit!” had me feeling optimistic from the start. Moving from overseas is difficult, but achievable nonetheless, and by closely following MiamiBeach411’s good advice, I also managed to move here successfully. Doug visited South Beach to find a neighborhood he liked by walking the streets and getting to know the area before he actually committed to moving. This is an absolute must if you are planning to move here. How else will you know if you like it unless you visit? Miami is portrayed in a certain way in magazines, TV shows and movies, but that is for tourists, for the people coming to spend a 2 week vacation out of their 52 weeks a year. It is not real and living here is not like that. Visiting alone if you are planning to move here alone is the first way to see if Miami is the place for you. So I arrived in Miami in September to case it out for a week. I came prepared as Miami is not a city where things will happen easily for you. I bought a guide book and a map and went out exploring as Doug had done previously in his story. I walked miles that week, looking at apartments, taking photos of buildings, meeting landlords and owners and soaking up the atmosphere in this crazy little city. I made sure to do things I would do if I actually lived here, so I took the beach yoga class and ate out alone. I used the local bus to go around South Beach so I could get to know the area. I had spent many hours reading the MiamiBeach411 relocating forums and could see that many people burnt out quickly when they moved here so I was determined to not be someone who moved on an extended vacation. As a result I spent my week exploring and getting to know the city. I made it to the beach maybe twice that week and have no real memory of it as that’s not what I came to see. I wanted the local experiences and to picture myself living here. If I could expand on Doug’s advice for that week, I would say that while you are checking out Miami as a future home, go out and meet the locals. Doug noted that “people here have the same basic needs for friendship and affection as people do everywhere else”. I met so many people on that trip, some of whom I still know today. Everyone was friendly and helpful when I asked for advice about living here and shared their own stories about how they had made the move. I began to see that Miami Beach was a city where no one was here first and that everyone had arrived from somewhere else. I asked people what had brought them here and heard amazing stories. Most importantly, everyone loved living here. And so with its pastel colors and daily sunshine, Miami Beach slowly cast its spell over me. I knew that I just had to live here. Back in England I once again followed the article’s advice, keeping a close eye on Craigslist to look for apartments in the area I had liked the most. Moving with no credit or bank account prompted me to look for an apartment with all utilities included, as one rent check would be easier than trying to set up internet and electric bills. I eventually found an apartment in the area I liked in my price range, and began emailing the realtor. Miami is full of scam artists so I had the realtor send me real photos of the unit and give me as much information as possible. Renting sight unseen was a risk, but one I had to take as I did not want to stay in a hostel with all my worldly belongings when I moved. I checked out the address and building online and went through the Condo Board application, again reassuring me this was no scam. I signed a 6 month lease, paying first, last and security but was still able to rent with no credit history. All I needed was references, which anyone could provide. This was my first taste of Miami… they don’t care who you are, as long as you can pay. With the lease in my name it was time to buy that one way ticket. One of my dreams when I lived in England was the final scene from the movie The Devil Wears Prada, when Anne Hathaway’s character throws her blackberry into the water fountain and walks away from her job. Of course, telling people I was moving to Miami had people looking at me in disbelief. But with the memories of South Beach still fresh in my mind, I gave the required notice I needed to pack up my life and move across the pond. After visiting in September, I moved here in November 2008. The first few weeks in Miami were interesting to say the least, and I will write more on that next week. 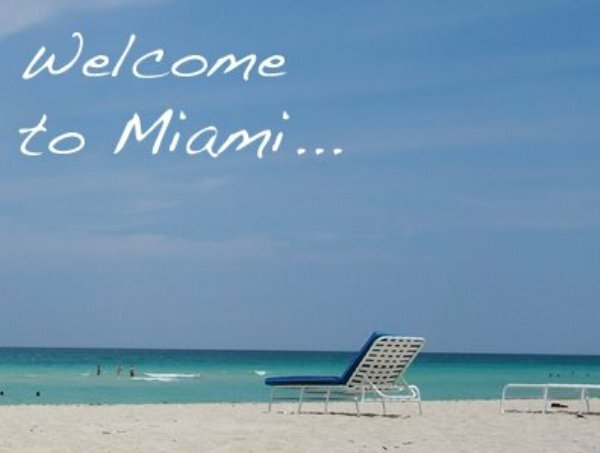 But thanks to MiamiBeach411’s article and advice, I successfully moved here from England. Yes there were days I wanted to go home. But to quote Doug one final time; “Naturally, life’s complications will stay with you no matter where you go, but they’re a lot easier to deal with among the palm trees and the turquoise water”. "How I Moved to Miami from England"
Wow, Jess! I’m speechless! It’s funny how the most seemingly selfish of pursuits (e.g., me looking for paradise) can turn out to be the most inspirational things to others! I’m glad my story was able to inspire you, and that you’ve been able to fit in so well to your new environment! Now, in the forums, I continue to learn about Miami through your experiences, so you’ve more than repaid the favor. Great article Jess! I also moved to Miami Beach from England. In a very different way, but nonetheless having grown up in a grey and depressing UK (don’t take it wrong the UK is absolutely wonderful…to visit), I knew there were better options out there. After spending a good ten years travelling the globe Miami Beach is the ONLY place I feel happy calling home! Thanks for sharing your post! Just curious if you had a job lined up. I only moved from Ft. Lauderdale to South Beach and not having a job to look forward to I didn’t think it would be that difficult to find a new one, although I’m significantly older then you and I know here that makes a difference. Now living off of my savings, I regret leaving my job. I don’t blame sobe, it’s the best place to live, but unless you have a huge amount of money to live on until you land a job, and trust me, there are hardly any places that include elec. unless you go further north, it’s not easy to find. Nice to read your success story, where as mine was not. I am living here on Euclid Ave. so if anyone knows of a job for a middle aged woman who isn’ too bad looking, please advise! Hiring at 411?? Great article Jess! I too found Doug’s article inspiring, and finding his article helped me find the forums! Instead of Hawaii my other consideration was California. You had great luck renting sight unseen. I was almost ready to do that as well but when I saw the place in person I’m glad I didn’t! Now people have 2 relocation articles to read! Hi Sandra, I did look for work in the week I came to explore Miami and was very lucky to find a job. I also saved a lot of money before I came but I still really struggled in the first few months that I lived here, eating cereal for 2-3 meals a day. Coming at the start of the tourist season helped and around the end of summer, there are more jobs that can be found. I hope you find a job soon! Great follow up to Doug’s article, Jess!!! We’re all so glad you made the move. I can’t wait to read more! Thanks for the kind words everyone. Next week I have a story about all the things you need to know once you actually get to Miami, learned the hard way by me! I’m a Canadian who would love to live in Miami. I spent a week there last July and had a great experience. One problem though: Working visas, green cards and all that are so hard to get for the US. This would be the only thing keeping me from making the move. Any tips anyone can recommend? Hey Jess, are you actually still living in Miami? This would really interest me as I want to do the same. At the moment I’m in Hamburg, Germany but have felt over the past couple of years that it’s time to move on! And as you rightly say, its kind of scary but very exciting at the same time. And I get that look you got when I talk about it. But I don’t mind. I did when I left England for Germany. If you want to move here, my advice is above. It most certainly worked for me. This is amazing! Did you have to get a work permit? Before you could go and stay? At the beginning of the article I mentioned that I have dual nationality so I didn’t need a work permit. I actually have 2 passports, one for the USA and one for the UK, so I never had to worry about green cards and visas. This is a big concern for many people though, and those work permits do exist, you just need a company to sponsor you to come over, or come over on a student visa. Dear Jess, my intention is to form a company in Miami. This would make easyer the permits right ? I am from Spain. I am not sure of the laws but if you have the money to start your own business in America, there are special visas for that. Good Luck! Hi Jess, your article is extremely helpful - I’m from the UK and have just been approved a visa for the US. I’ve been going back and fourth in my mind between Miami and New York as I’ve worked previously in both areas but only for a short period. My main concern is work in Miami as NY offers more opportunities but much prefer the Miami climate/culture - I’m a broadcast producer and have a few contacts for freelance work but looking for something permanent to give me more security whilst I relocate. Do you know of any good recruiters? Not necessarily only in broadcast/media but looking for a recruiter that is reputable/helpful. Hi Richard, What was your visa for? If it isn’t a work visa, and you need to look, I’d suggest looking in both NY and Miami. Miami does not have as many job opportunities. Unfortunately I do not have any contacts in broadcast media, but I wish you lots of luck! Thanks Jess. The visa allows me to work in the US but expires in 6 months before I have to re-apply which is why I’m looking for something just to get me settled with some decent income (trying to avoid just moving and spending all savings!). I’ll keep searching for recruitment companies, thanks for the advice - fingers crossed! Sorry in advance for any mis-spelling, as am typing this from my phone. I read your story about moving from UK to Miami and was wondering if you could please give me some advice. I visit Miami once a year for the passed 5 years and after my first visit, I loved it. I was made redundant 4 years ago and after i starting thinking its time to start fresh and Miami was where I want to be. I’ve been looking for jobs over there but no luck. I am a qualified teacher but only for 16plus age group. I haven’t had any luck yet, as the colleges I been applying to either saying, I need a work visa which I know I do but was told by U.S. embassy here in London few years back that if I found a job that would sponsor me I will be able to get the work visa that way, so that’s what I been trying to do. Few colleges said I needed more years experience as I have only been teaching nearly 3years now. I was a office manager before for 7years but was made redundant. I feel so lost to why I can’t seem to make this move after been trying for so long, then I realise I have no real resources to go off, all I been doing is applying for jobs at colleges, so was wondering if you have any ideas on what I could try. When I visit there I normally ring and speak to colleges HR but they all been saying I need to apply on line, so I been doing that, just no luck. So if you have any ideas on what else I could try, it would be much appreciated. Your article is so inspiring and helpful. I’m terrified; I have just been offered a job in Miami which has a healthy salary and benefits but I’m so scared. I’m 31 and worried that I am just delaying my singledom further. I want to settle down with someone but at the same time I want to live abroad- and I love Miami! I am in no way a huge party girl- choosing nice long dinners with wine over a party. Were you single when you moved to Miami and what advice can you give for someone like me who is worried that I’m simply pausing my life? Hi Jess, I too want to move to Miami from the uk. I have a two year old daughter so my move will probably be a lot more difficult as I have to research cost of nursery, elementary etc. Can you point me in the right direction as I am only in the thought phase and don’t really know where to start to find out about child care etc. I have just graduated with a ba honours and will start my masters in psychology in October. Not sure whether to move before then and start my masters in the states or not. Any help would be appreciated. I’m a single mother and just feel stuck in London as if there is nothing more to life for me. I want that great escape too! !